I love collecting old "How to Draw Cartoons" books, and this one is among my favorites: "Popeye's How to Draw Cartoons" by Joe Musial from 1939. 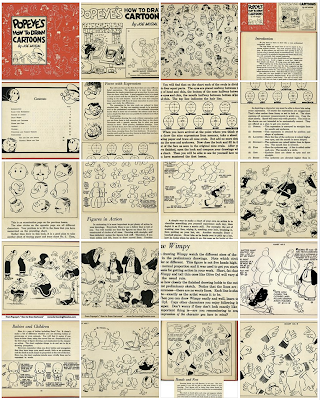 I finally got a giant scanner, so now I can share this really fun vintage cartooning book! 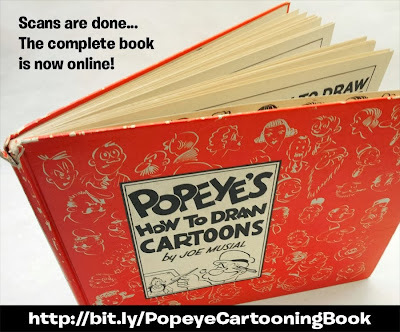 The thumbnail below gives you just a hint of what's inside; There's about 40 full-sized pages of classic cartoon art and "How to draw cartoons" instruction. Click on the picture to jump to the photo album. to see the HUGE full-sized comic book scan! Loose and lively brushwork from animation story man Irv Spector. And what a strange rushed composition in that last panel! Sometimes, you really need someone to write, “The End” in the corner to keep you from thinking you missed something. But that’s it. That rushed weirdness is one of my favorite things about those old one-page filler comics. 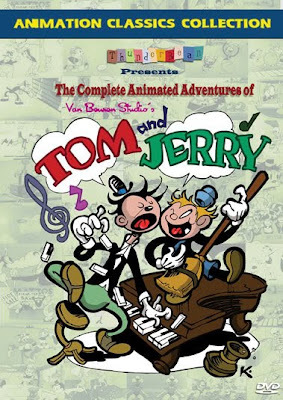 Check out the official Irv Spector blog at http://irvspector.blogspot.com/ for more comic book art and animation storyboards and photos and stories about the life of this versatile and dynamic cartoonist! from “Supermouse the Big Cheese Summer Holiday Special” published by Pines Comics in 1957. More about Irv Spector and his cartoon storyboard art here: http://irvspector.blogspot.com/2009/09/lamour-merrier-paramountfamous.html Great stuff!